Confession: I have never made a pie (well, until last night that is). Tarts, yes. Cakes, plenty. But something about the pie has always made me shy away – maybe it’s the fear of messing up that oh so delicate flaky crust. As I faced a somewhat gloomy Sunday afternoon with nothing to do and a friend’s beautiful kitchen at my disposal (thank you Katherine!) I decided to finally give pie making a try. 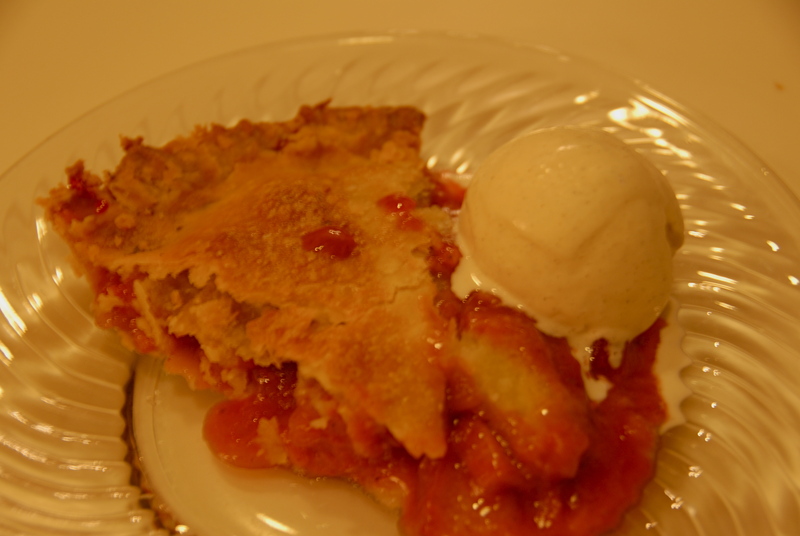 After all, there are only a few pies I even care for and strawberry rhubarb is absolutely one of them. Gathering my ingredients (note to self: the early bird at the farmers market catches the rhubarb – I had to venture to 3 markets to finally secure some of this ruby goodness)I took to making Louise Piper’s blue ribbon winning pie. The crust is made not with butter, but with vegetable oil – sounded intriguing and looked delicious! To start, preheat the oven to 400°. Sift together flour and salt into a mixing bowl. 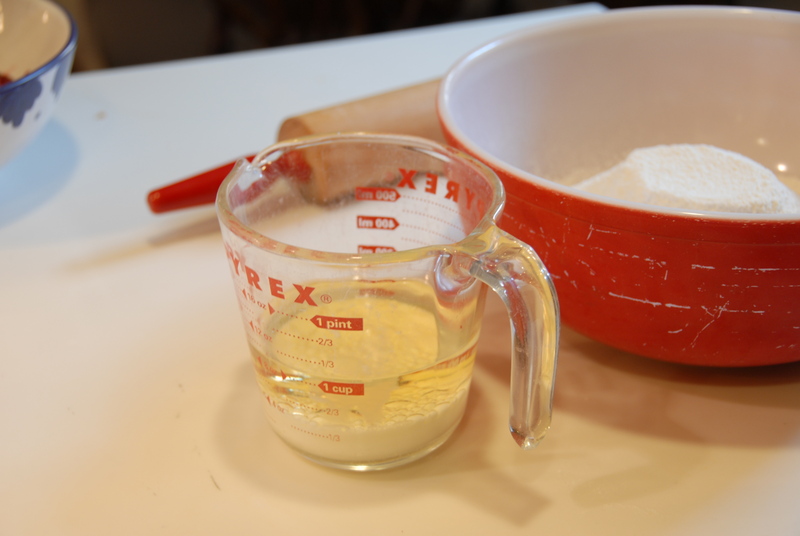 Measure oil into a measuring cup, then add milk, but don’t stir together. Pour oil and milk into flour mixture. Stir until dough just holds together. 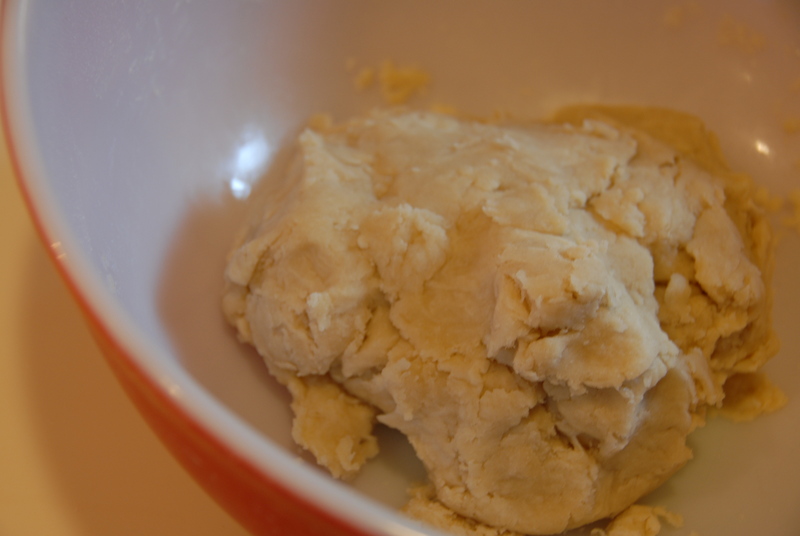 Divide dough in half, shape into 2 balls, and flatten slightly. Roll out each ball between two sheets of wax paper into 12″ rounds. 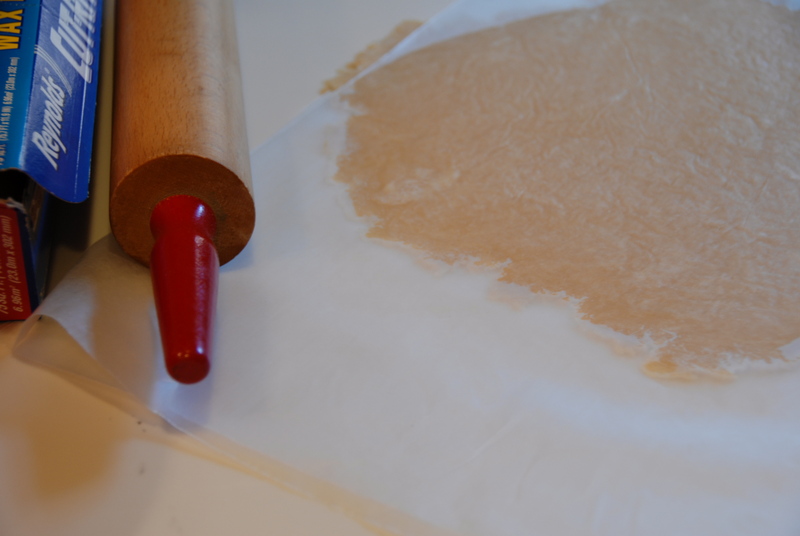 Transfer one pastry round (discarding wax paper) into a 9″ pie plate, and set other pastry round aside. 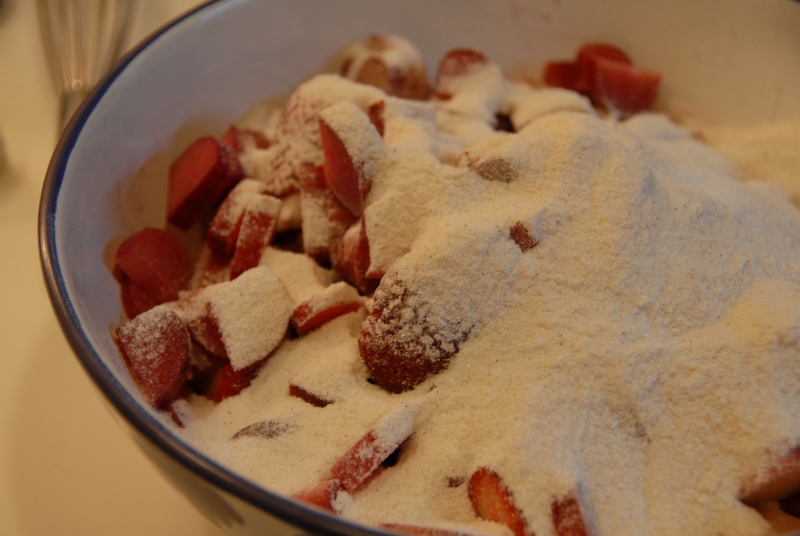 Onto the filling… Mix together 1 1⁄4 cups of the sugar, flour, nutmeg, and cinnamon in a large mixing bowl, then add rhubarb and strawberries and toss well to coat evenly. Fill the bottom crust with the fruit mixture and scatter butter on top. Cover with remaining pastry round and crimp edges together to seal. Score top to allow steam to escape, brush with milk, and sprinkle with remaining sugar. 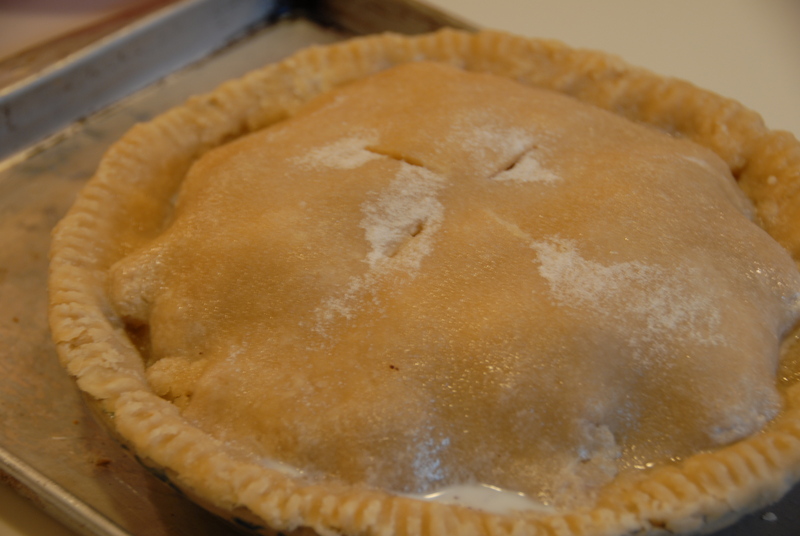 Place pie on a baking sheet and bake until crust is golden and filling is bubbling, about 50 minutes. If edge of crust browns too quickly, cover the edge with a strip of aluminum foil to prevent burning. If willpower allows, let the pie cool for an hour before serving (all we could manage was 40 minutes before digging in). And be sure to have some good vanilla bean ice cream on hand. I feel as though this is only just the beginning of my adventures with pie – I don’t know what I was so worried about, the pie wasn’t too difficult to make and tasted amazing. Overall, a Sunday afternoon well spent. 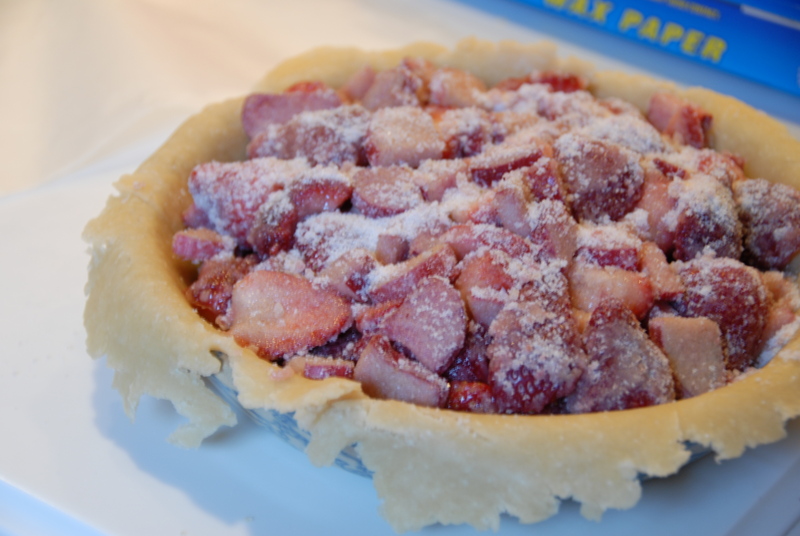 This entry was posted in Rhubarb and tagged crust, milk, pie, rhubarb, strawberry, sugar, vanilla ice cream, vegetable oil. Bookmark the permalink.